Previously, rooting of phones has been for the elites and not everyone could actually decode the importance of rooting his/her Andriod device. I remembered talking about how to root Tecno Phantom A3 m9 using Vroot on this blog right? if you missed that post, do make out time to read it up. Today, I will be talking about how to root the Tecno R7 Andriod device without a Pc. Incase you are looking for the specification of the Tecno R7, you can check out the review of the specification, Features and Price of the Tecno R7 in my previous post. It explains everything you need to know concerning the mobile device. There is a need for you to root your Andriod device if you must run all applications on your smartphone. The need for a PC is not always necessary to users who wishes to root there devices. Afterall, the google playstore houses numerous softwares that will aid you perform this task with no hassle. Firstly, you must understand the reason you need to root your device and why you should not root it. If you wouldn’t be using the Tecno R7 for more advanced things, then there is no reason you should use it. For light users, whose major aim of patronizing the phone is to surf the web, ping, receive messages from the various social medias etc, then you need not to root your Tecno R7. But for users who are into the business of making optimal use of there smartphone, I mean the people with styles, then the need arises when some applications fail to install on your smartphone as a result of it not being rooted. 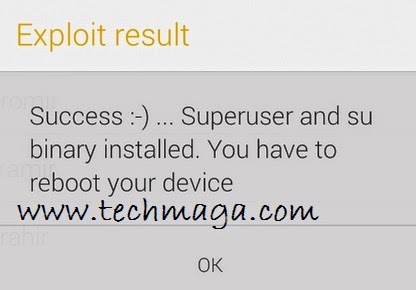 The steps below shows you how to successfully root your Tecno R7 andriod phone without a Pc. n Unzip before installing on your device. Once done, follow the guideline two below. Have you installed the framaroot on your device? If Yes, you should be seeing something like “ Select an exploit in the list below to potentially root your device.” Among the options, you are to select the Barahir exploit. After a few seconds, you should be notified that Superuser and su binary have been installed. Below is the screen shot of the expected message you should see on your phone. Upon confirmation of this success message, You are expected to reboot your device and thats it. Your device is fully rooted. Let me hear you out, I wish to know what you think of this tutorial. I'd love to hear what you think about this. Use the comment box below to tell me what you think.